Dental Implants are a revolution in the realm of tooth replacement. Before they made their way into dentistry, the only option for tooth replacement was removable dentures, which made chewing some types of food difficult, and sometimes impossible. Dental implants are a permanent form of tooth replacement that is not removable. A dental implant is very different from other tooth replacement options. A titanium screw is inserted and allowed to fuse with the jaw bone. The screw is then fitted with an abutment and a crown to make it look just like a natural tooth. All tooth replacement options can improve visual appearance. However, they cannot help preserve the bone that breaks down after teeth have been removed. 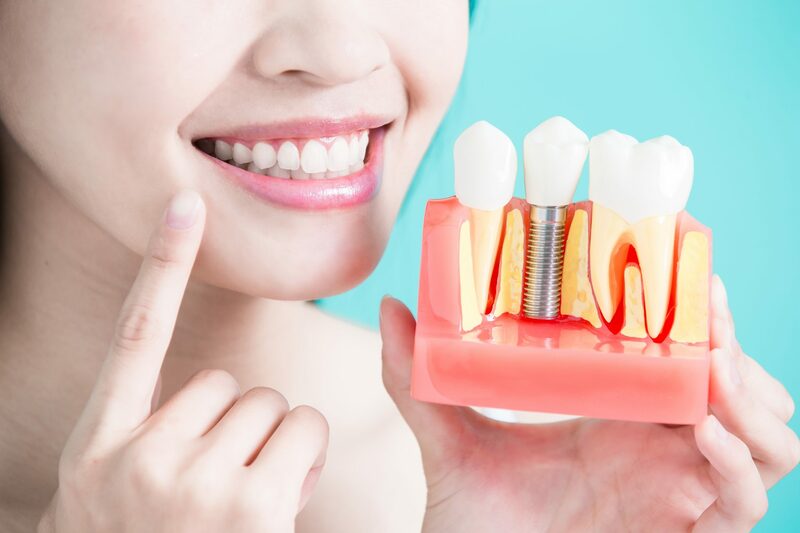 Dental implants are placed in the empty space where a tooth would be found, which preserves the bone, and the jaw structure. They can be used individually, or as a full mouth replacement option without needing to anchor to other teeth. Having a dental implant placed sounds more dramatic than the procedure really is. The procedure is actually fairly quick. An incision is made into the gum tissue where the implant will be placed. Variously sized drills are used to create the proper sized hole in the bone for the implant to be inserted. After the hole in the bone has been made, the implant is screwed into the bone. Once the dentist is satisfied with the placement of the implant, the hole is then stitched closed around the implant. This procedure may sound extremely invasive but it can be performed under local anesthesia, or under sedation. The operation should be completely painless. There may be some post-surgical pain while the incision heals and the implant merges with the bone. It will take 4 months for the implant to heal before you can have the crown added to make it appear as a natural tooth.